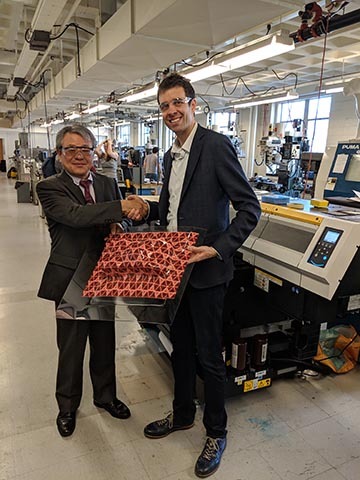 Suwanee, Ga. – Mimaki Engineering Co., Ltd., parent copy of Mimaki USA, announces its participation as one of the founding members of the ADAPT (Additive and Digital Advanced Production Technologies) consortium launched by the Massachusetts Institute of Technology (MIT). ADAPT is a consortium directed by Professor John Hart, who leads the MIT Laboratory for Manufacturing and Productivity. With the aim of supporting the advancement of the additive manufacturing (AM) industry, ADAPT will promote research and education for next-generation manufacturing technology based upon AM processes, which includes 3D printing. ADAPT’s founding members hosted a kick-off meeting at the international trade fair for addictive manufacturing and industrial production, Formnext, held in Frankfurt, Germany in November. The next meeting will be in spring 2019 at MIT. ADAPT founding members include: ArcelorMittal, BigRep GmbH, Dentsply Sirona, Electro-Optical Systems, Formlabs, General Motors, Mimaki Engineering, Protolabs, Renishaw, Robert Bosch GmbH, and Volkswagen AG. Mimaki Engineering Chairman Akira Ikeda and MIT Professor John Hart at the MIT manufacturing lab and build space.